A BP clean up crew works to remove oil from the shores of a Port Fourchon, LA, beach May, 2010. 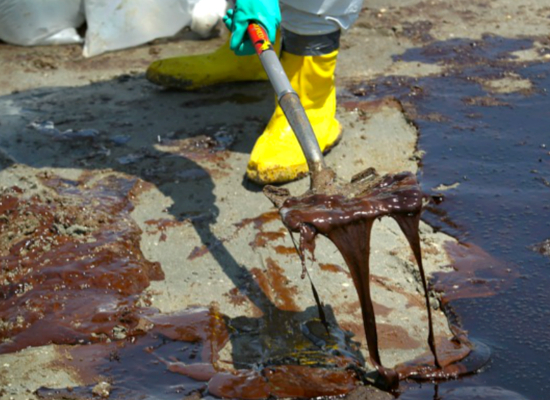 Photo credit: John Moore/ Getty Images, courtesy of Propublica—view their entire BP Oil Spill Slideshow. BP CEO Bob Dudley said that, instead of the victims of his corporation’s recklessness, the “biggest beneficiaries” in the suit are the plaintiff’s attorneys. According to the document, BP has spent at least $4.5 billion on defense lawyers in 2012, and that number is dispersed through only four lawyers. On average, that’s in the neighborhood of $750 – $2,000 per hour. Which litigators are the “biggest beneficiaries” again? No matter how much money BP spends on PR, or what sort of rhetoric Bob Dudley spews, it will never erase BP’s gross negligence and reputation as a bad actor. In May and June of 2000, BP’s Grandemouth refinery in Scotland was responsible for three incidents, two involving severe leaks which resulted in large amounts of hydrocarbon pollution into the atmosphere and into River Forth. Criminal charges were brought against BP for two of the three incidents. After pleading guilty, BP was ordered to pay 1 million pounds. BP’s negligence and disregard for safety was responsible for the Texas City Refinery Explosion that occurred in March, 2005. The explosion resulted in the deaths of 15 workers and injured 180 more. The lower tower that overfilled and exploded was not equipped with the proper warning alert systems. Operators were fatigued and overworked, putting in 12-hour shifts for up to 29 days straight, and the “operator training program was inadequate,” according to the U.S. Chemical Safety and Hazard Safety Investigation Board. This is but a small set of BP’s operational shortcomings. BP was responsible for the deaths of 11 rig workers in the Deepwater Horizon disaster of 2010. The company was charged with, and pleaded guilty to, 11 counts of felony manslaughter related to the deaths. But instead of placing those responsible for the explosion in prison, BP was ordered to pay a $4 billion settlement, another troubling sign that if one has the money, he or she can buy their way out of anything. The system is clearly broken when a company with an endless sea of cash can violate environmental laws, disregard sound operational oversight, and even put people’s lives in danger, but rather than suffer true justice, BP can just cut a fat check and be on its merry way to break another law, or kill another person. The company keeps committing these atrocities because it knows it can get away with them, because it can afford to do so.